The 200 meter long and 90 meter wide arena was planned as an independent wide-span structure, free of interior columns. The athletes and spectators can enjoy panoramic views of the Bavarian Alps through the continuous glass facade which stands as a transparent band between the cloud-like roof and the concrete grandstands that flow into the landscape. At the same time, passers-by can look into the stadium interior and catch a glimpse of daily activities. 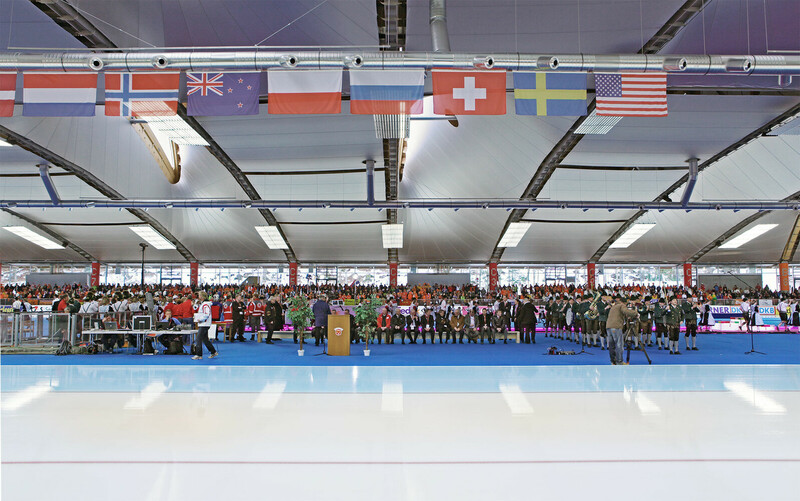 The roof itself embodies a precisely designed interior climate concept that ensures optimized energetic, economic, and sustainable operation of the ice track on a daily basis. On the underside the roof is fitted with a “Low-E” membrane stretched between the lower cords of the ten-meter high timber and steel trusses. The function of this engineered fabric is to reflect the ice’s own cold thermal radiation back onto the speed track, thus maintaining the low temperature of the ice surface. Simultaneously, this membrane maximises the quantity of diffuse daylight that streams into the stadium through the roof’s seventeen large north-facing skylights. A number of existing support buildings were also upgraded in order to integrate them into the arena’s overall concept of optimum energetic performance. They accommodate offices for the stadium director and the training staff, as well as workshops and spaces for the ice maintenance equipment. The major technical plants and extensive changing rooms are discretely located below the entrance concourse at the level of the ice field. 20.750 m² / 223,351 sq.ft. 308.237 m³ / 1,088,529 cu.ft.